Tony and Olivier Award-nominee Alfred Molina stars as Tevye in this new production of an American musical classic, with a book by Joseph Stein, music by Jerry Bock and lyrics by Sheldon Harnick. The production also features Randy Graff as Golde, Nancy Opel as Yente, and Sally Murphy, Laura Michelle Kelly, Tricia Paoluccio, Molly Ephraim and Glee's Lea Michele as Tevye's daughters. The production was directed by five-time Tony Award-nominee David Leveaux, with musical staging by Jonathan Butterell and music direction by Kevin Stites – all of whom collaborated previously on the smash hit revival Nine (also recorded by PS Classics). 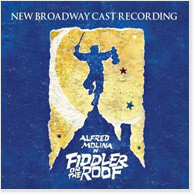 This 73-minute recording is the most complete version of Fiddler available on CD. In addition to beloved songs like "Matchmaker," "If I Were a Rich Man," and "Sunrise, Sunset," it includes several tracks missing from the original cast recording, as well as a new song, "Topsy-Turvy," that Bock and Harnick penned especially for this new production (their first collaboration in over thirty years).